We have reached the #1 spot on our countdown of the Top 10 Customer Complaints of 2012! If you are just joining us, or missed any of our previous posts, check out the other entries in our countdown: #10, #9, #8, #7, #6, #5, #4, #3, and #2! There are many key components that contribute to the customer experience at every restaurant including the decor, location, service, and price. As our countdown has revealed, customers are sensitive to any one of these elements. However at the end of the day, it’s the food that often emerges as the single most important factor for most customers landing food complaints in the number ONE spot of our countdown of the Top 10 Customer Complaints of 2012. Beyond the fact they are the most numerous, food complaints are potentially the most harmful for your restaurant. While a customer disappointed with service might chalk it up to a bad day, impressions about food are much harder to recover. As such, complaints about the food can have dire consequences on your online reputation and eventually your revenue and longevity. Food is the single element that can elevate a hole in the wall to an establishment enjoyed by many customers or ruin an establishment once considered among the best. There are a plethora of reasons why customers complain that the food is bad. “Too salty”, “dry”, “too oily”, and “bland” are the most common. In order to help you take a proactive approach against future food complaints at your location, we are going to examine some of the key reasons these complaints occurred in 2012. Ingredient quality. Every restauranteur knows that a dish is the sum of it’s parts. While not every ingredient needs to be top of the line, it’s important that your dishes are strategically composed with high-quality ingredients for key components at your price point. Whether you are a fast food or fine dining establishment, proteins such as meat and fish appear to garner the majority of ingredient complaints as most casual diners can evaluate the fish quality at a sushi restaurant or meat quality at a burger joint. Secondary ingredients and and other components such as sauces may sometimes go overlooked by many but provide a great opportunity to elevate your dish. If you grow your own spices or use locally grown products, call attention to this in your menu so customers are aware of your efforts to provide higher quality ingredients. Diners often direct ingredient quality questions to staff members so make sure they are up to date and knowledgeable. Preparation. Upon examination of 2012 feedback, one of the most striking realizations is that the many of food preparation complaints involve over or under-cooking the primary ingredient of a given dish. That fact that a pizza place struggles with properly preparing the crust or a steakhouse over and under cooks a steak is simply embarrassing. Make sure your staff is successful at preparing the primary ingredients and evaluate this over time. If you are launching a new menu item, walk through the preparation of the dish and have key staff members taste it so they know how it should be prepared from the customer’s perspective. Presentation. With the exception of some establishments, your customers are not dining in the dark. The overall look of your dishes directly impacts how customers experience the food at your establishment. A thoughtful plate composition can elevate a given dish and call attention to high-quality ingredients. Consistency with both preparation and presentation is important as well. 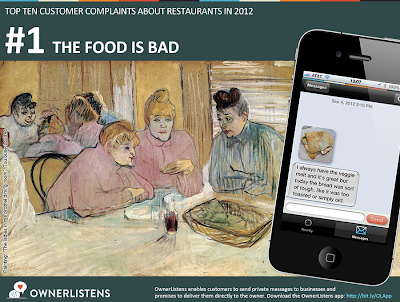 A number of food complaints in 2012 arose from diners who ordered the same entree but received different looking dishes. Remind your servers to check the preparation and presentation of each dish before serving customers – a couple seconds of attention can help you avoid food complaints. Expectation. When a customer expects one thing and receives another, it positions him or her to scrutinize and evaluate your food more closely. It’s important to tread this line carefully; exceeding expectations and wow-ing customers can help the food at your restaurant shine, disappointing them can lead to complaints. Customers know their own tastes and preferences better than you do so take this into consideration when describing your food in the menu and in voice. Surprise ingredients and unconventional preparations can go both ways. Make sure you are factoring in the expectation of your customer base with your decision making. Other contributing factors. Take a look at the other complaints in our countdown. At the end of the day, the dining experience for your customer is a combination of every aspect of dining from the food and service to the decor and ambiance. While the food has the power to stand out on it’s own, each of these other factors can influence customers’ sentiment about the food. In order to prevent food complaints and satisfy your customers, it’s essential to pay attention to each issue to ultimately provide a high quality experience at your establishment. Every time a customer gets serviced at your restaurant they have a singular unrepeatable experience. They are the only ones who know how they feel about the service, the ambiance, the food, etc. They are also the only ones who can give you real feedback about their customer experience at your establishment. This feedback is a valuable resource that you can use to improve and provide the best possible customer service over time. OwnerListens is the perfect tool to do this as it provides customers with a safe, convenient, and anonymous platform to send you feedback directly. Telling your customers you use OwnerListens shows you truly care about their experience and value their opinions. What we are most proud of with our countdown of the Top 10 Customer Complaints of 2012 is that these complaints all occurred privately within the OwnerListens platform. This means that for over 6000 businesses, customers used OwnerListens to send complaints directly to the owner instead of posting negative reviews online! Sign up for OwnerListens now if you haven’t already! We are excited to see what complaints 2013 brings! Remember our motto: “Feedback is a Gift”! Owners – have tips for how to deal with food complaints at your restaurant? Let us know here in the comments. Consumers – if you have a complaint for any restaurant you recently visited, use the OwnerListens app to conveniently send it to the owner directly, privately, and anonymously!